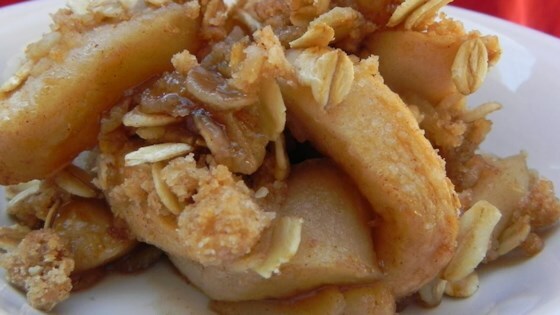 "Yummy warm apple dessert. If desired, serve with whipped cream and additional caramel topping." Stir the caramel topping and cinnamon together in a bowl. Toss in the apples, mixing until evenly coated. Spread apple mixture into an 8-inch square baking dish. Mix flour and brown sugar into the same bowl used to mix the apples. Cut in the butter with a knife or pastry blender until the mixture resembles coarse crumbs. Stir in the oats, then crumble over the apples. Bake in the preheated oven until the apples are tender and the topping is golden brown, 45 to 50 minutes. Served warm and topped with butter pecan ice cream and a drizzle of some more caramel is really yummilicious. This is so easy to make. I used tart green apples so it was not super sweet. It was perfect served hot and topped with a scoop of vanilla ice cream. Yummy and easy to make! Used granny smiths also added chopped pecans to the strusel topping. Served with vanilla ice cream and more caramel syrup. Next time will make my own caramel! !